24/7 Wildlife Removal provides a complete array of pest wildlife services for residential and commercial property throughout the greater Orlando area, plus Tampa, Jacksonville, and Boca. We also provide commercial bat control & removal state-wide. Whether you have squirrels living in your attic, a raccoon eating your pet's food, digging in your yard, a snake in the grass or bats in the belfry, we can solve the problem in a speedy and professional manner. We treat every customer, from the individual homeowner to the large corporation with the highest level of professionalism and attention to detail. Check out this website for a description of Orlando pest control services offered or to learn about Florida's wildlife. Entry Point Repairs - We specialize in wildlife that enter the home, usually living in the attic or walls of a house. The only way to permanently solve the problem is to seal up the entry points by which they can enter. All of our repairs are of the highest quality and fully guaranteed against animal re-entry. Attic Decontamination - Wild animals can contaminate your attic or home - they can bring in parasites, zoonotic diseases, debris, fur, and they always leave behind feces, urine, and other biohazardous waste. It's often important to fully clean up and decontaminate the area after animals have been removed. Wildlife Trapping - Of course we perform wildlife trapping. Most of the time, we trap and remove wildlife living inside homes and attics, but we also trap and remove nuisance wildlife in all sorts of situations - from raccoons pooping in pool to armadillos digging under the house, to snake removal. Building Inspections - We fully inspect every square inch of your home to find those animals, and find out how they are getting inside. On the roof, in the attic, under the house. This particular photo is of me crawling under a house to remove a dead opossum. No matter how tough or dirty the job, we will do it right. Rat & Mouse Control - One of our specialties is Orlando rat control. Roof Rats inhabit every nook and cranny of central Florida, and are the most common animal that enters the home and attic. We are the absolute best at complete and permanent removal - safely and within a short time frame. Bat Colony Control - I pride myself on professional bat control and removal in the state of Florida, and consider myself one of the country's top experts, having worked hundreds of jobs, many of which no other company would or could take. If you need Florida bat removal, please give me a call, and we will schedule it. It takes a dedicated person with a lot of experience to do the difficult wildlife removal jobs correctly - when you have animals in your building or attic, it's imperative that all the animals are removed properly, that all of the damage is repaired, that all of the entry points into the home are permanently sealed, and if necessary, that the attic is properly cleaned. This is not the type of work for a regular pest control company. I offer extremely fair prices for this industry: on average less than half the total charge of the larger franchise companies who do inferior work. Please call me any time if you wish to discuss your nuisance wildlife problem. 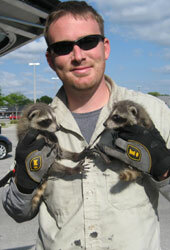 Orlando Wildlife Removal is operated by Gregg and Ben, servicing Orange County FL and Seminole County. We service the greater Orlando Florida area, including Apopka, Lake Mary, Sanford, Maitland, Longwood, Oviedo, Downtown, Ocoee, Winter Park, Conway, Doctor Phillips, Winter Garden, and more. Our number is 407-233-3838. Tampa Wildlife Removal is operated by Mike. We service Hillsborough County and Pinellas County and the greater Tampa Bay region, including of course Saint Petersburg and Clearwater. Our number is 813-404-7033. 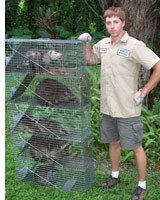 Boca Raton and Fort Lauderdale Wildlife Removal is operated by Patrick. We service the SE coast of Florida, north to West Palm Beach and south to Ft. Lauderdale and northern Miami. Our number is 561-331-0224. Jacksonville Wildlife Removal is operated by Andrew and Austin. We service NE Florida, Duval and St. John's County, Saint Augustine, and the whole northeast Florida coast . Our number is 904.415.5209. I have personally trained many close friends in the field of nuisance wildlife removal, and they operate in these areas: Portland Animal Control is run by my friend Tim. Seattle Animal Control is run by my friend and brother-in-law Sean. Chicago is run by my friends Ben and Dan. Phoenix is run by Joe. Houston is operated by Angie. Denver is run by Marc. Boca Raton and Fort Lauderdale are operated by Patrick. West Palm Beach is run by Patrick and Steve. Tampa is operated by Mike. Jacksonville is operated by Andrew and Austin. I personally service central Florida, along with Gregg and Ben. However, we have many friends that we have personally trained, using the same extremely high standards of quality and professionalism in the field of problem animal control. If you need Boca Raton Animal Control in West Palm Beach and Fort Lauderdale, our friends at Wildlife Removal Service, Inc are considered the most skilled critter trappers in Southeast Florida. Mike of All Pro Wildlife LLC in Tampa also does excellent work, and he services Clearwater and Saint Petersburg as well. Andrew and Austin run an excellent operation in Jacksonville, FL. All of our companies provide expert wildlife trapping and rodent extermination services, as well as professional bat control, bird exclusion and abatement, and general critter removal, including raccoons, squirrels, snakes, armadillos, opossums, rats, mice, and all wildlife in Florida. Tip of the Month: What is a foothold trap? EA foothold trap is often used by people who were trying to capture animals that can be quite dangerous. These are frequently used for trapping such things as bears or wolves, because of the successful manner in which it is able to hold the leg or foot of the animal, without causing serious damage to it. To release the trap there is a mechanism to decide that is released so that the jaws are not locked anymore and will come open to release the animal’s or the human being’s foot. This is a very effective trap in helping to capture an animal. For those of you who may find that there is a dangerous creature around your property, don’t go out and buy this on your own. The truth is that you may be successful but then ask yourself what you will do with the animal afterwards? Read more about What is a foothold trap?.